Nature has no equal when it comes to the variety of colors and textures she paints with, and you can highlight some of her artistry in your own home with designer Harry Allen's playful paintbrush vase. Hand cast from actual brushes, the vase's neutral tones and unconventional silhouette highlight the brilliant colors and forms in a bouquet. Made in China from resin and marble. Includes glass insert to hold water. Harry Allen was born in 1964 in New Jersey and currently resides in New York City. As an award-winning interior and industrial designer, Allen's work is always innovative and imaginative. He continually surprises the viewer with his work by using interesting subject matter and inventive materials. Allen has received numerous awards for his interior designs and for his product designs. He has worked as a product designer for clients such as Warner Bros., Umbra, Magis, Aveda, Ikea and Steuben. His work is on display in the permanent collections of the Museum of Modern Art in New York City, the Brooklyn Museum of Art and the Denver Museum of Art. 5" L x 6" W x 12" H, 14 oz. This was so different in a good way .. never seen anything else like it.. This was a beautiful vase designed by Henry Allen. My daugther is an art teacher and she was thrilled with this concept and for the facdt that some of the brushes were ones he used. This is a perfect gift for the person who has unusal taste for artsy decor!!! Beautiful, very unique. Great gift for an artist!!! 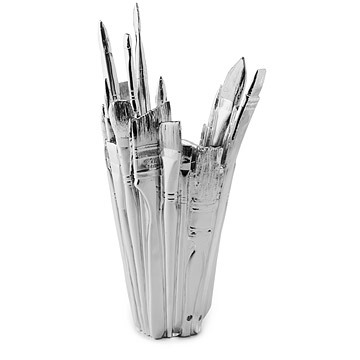 This is NOT the chrome vase pictured on the Uncommon Goods website!!! They sent me the WHITE vase instead!!! I am SO upset about this purchase!!! I looked for this Harry Allen product online and found two versions: white and chrome. I could have purchased the white vase elsewhere for $30 less than I paid at Uncommon Goods, but I wanted the chrome vase so I ordered it from Uncommon Goods. When I called to ask why they sent the white vase instead of the chrome vase, they couldn't explain it. This item will definitely be going back!!! It was THE perfect gift for an artist friend. incredibly unique and simply wonderful. I bought this for my mother for Mother's Day. She is an artist and went abolutely bonkers over this gift. She could not get over its beauty and creativity. To this day (6 weeks later) she is STILL talking about how beautiful and unique this vase is. This is a fabulous design. It is so unusual. It is perfect for any creative person. this vase is just awesome! Designer Harry Allen's playful paintbrush vase is hand-cast from actual brushes.